Coordonnateurs : Atwater Mary M., Russell Melody, Butler Malcolm B. This book offers valuable guidance for science teacher educators looking for ways to facilitate preservice and inservice teachers’ pedagogy relative to teaching students from underrepresented and underserved populations in the science classroom. It also provides solutions that will better equip science teachers of underrepresented student populations with effective strategies that challenge the status quo, and foster classrooms environment that promotes equity and social justice for all of their science students. Multicultural Science Education illuminates historically persistent, yet unresolved issues in science teacher education from the perspectives of a remarkable group of science teacher educators and presents research that has been done to address these issues. It centers on research findings on underserved and underrepresented groups of students and presents frameworks, perspectives, and paradigms that have implications for transforming science teacher education. In addition, the chapters provide an analysis of the socio-cultural-political consequences in the ways in which science teacher education is theoretically conceptualized and operationalized in the United States. The book provides teacher educators with a framework for teaching through a lens of equity and social justice, one that may very well help teachers enhance the participation of students from traditionally underrepresented and underserved groups in science, technology, engineering, and mathematics (STEM) areas and help them realize their full potential in science. Moreover, science educators will find this book useful for professional development workshops and seminars for both novice and veteran science teachers. "Multicultural Science Education: Preparing Teachers for Equity and Social Justice directly addresses the essential role that science teacher education plays for the future of an informed and STEM knowledgeable citizenry. The editors and authors review the beginnings of multicultural science education, and then highlight findings from studies on issues of equity, underrepresentation, cultural relevancy, English language learning, and social justice. The most significant part of this book is the move to the policy level—providing specific recommendations for policy development, implementation, assessment and analysis, with calls to action for all science teacher educators, and very significantly, all middle and high school science teachers and prospective teachers. 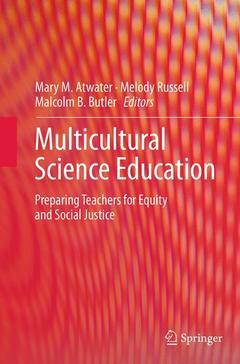 By emphasizing the important role that multicultural science education has played in providing the knowledge base and understanding of exemplary science education, Multicultural Science Education: Preparing Teachers for Equity and Social Justice gives the reader a scope and depth of the field, along with examples of strategies to use with middle and high school students. These classroom instructional strategies are based on sound science and research. Readers are shown the balance between research-based data driven models articulated with successful instructional design. Science teacher educators will find this volume of great value as they work with their pre-service and in-service teachers about how to address and infuse multicultural science education within their classrooms. For educators to be truly effective in their classrooms, they must examine every component of the learning and teaching process. Multicultural Science Education: Preparing Teachers for Equity and Social Justice provides not only the intellectual and research bases underlying multicultural studies in science education, but also the pragmatic side. All teachers and teacher educators can infuse these findings and recommendations into their classrooms in a dynamic way, and ultimately provide richer learning experiences for all students." "This provocative collection of chapters is a presentation in gutsiness. Ingenious in construction and sequencing, this book will influence science teacher educators by introducing them to issues of equity and social justice directly related to women and people of color. The authors unflinchingly interrogate issues of equity which need to be addressed in science education courses. It begins with setting current cultural and equity issue within a historic frame. The first chapter sets the scene by moving the reader through 400 years in which African-American’s were ‘scientifically excluded from science’. This is followed by a careful review of the Jim Crow era, an analysis of equity issues of women and ends with an examination of sociocultural consciousness and culturally responsive teaching. Two chapters comprise the second section. Each chapter examines the role of the science teacher in providing a safe place by promoting equity and social justice in the classroom. The three chapters in the third section focus on secondary science teachers. Each addresses issues of preparation that provides new teachers with understanding of equity and provokes questions of good teaching. Section four enhances and expands the first section as the authors suggest cultural barriers the impact STEM engagement by marginalized groups. The last section, composed of three chapters, interrogates policy issues that influence the science classroom." Foreword, Jane Butler Kahle.- Preface, Mary M. Atwater, Melody Russell, and Malcolm B. Butler.-Acknowledgements, Mary M. Atwater, Melody Russell, and Malcolm B. Butler.- Chapter 1. Introduction: Culture, Equity, and Social Justice for Science Teacher Educators, Malcolm B. Butler, Mary M. Atwater, and Melody Russell.- Part I. Historical and Sociocultural Perspectives on Science Teacher Education.- Chapter 2. The Systematic Misuse of Science - Andre Green.- Chapter 3. Second Class Citizens, First Class Scientists: Using Sociocultural Perspectives to Highlight the Successes and Challenges of African American Scientists during Jim Crow, Malcolm B. Butler.- Chapter 4. Science Education and Females of Color – The Play within a Play, Leon Walls.- Chapter 5. Sociocultural Consciousness and Science Teacher Education, Brenda Brand.- Part II. Foundations of Science Teacher Education.- Chapter 6. The Impact of Beliefs and Actions on the Infusion of Culturally Relevant Pedagogy in Science Teacher Education, Natasha Johnson and Mary M. Atwater.- Chapter 7. Motivation in the Science Classroom: Through the Lens for Equity and Social Justice, Melody Russell.- Part III. Pedagogical and Curricular Issues in Science Teacher Education.- Chapter 8. Negotiating Science Content: A Structural Barrier in Science Academic Performance, Barbara Rascoe.- Chapter 9. Internationally-Inclusive Science Education: Addressing the Needs of Migrants and International Students in the Era of Globalization, Charles B. Hutchison.- Chapter 10. Using Problem-Based Learning to Contextualize the Science Experiences of Urban Teachers and Students - Neporcha Cone.- Part IV. Equity, multiculturalism, and Social Justice in Diversity Issues in Science Teaching .- Chapter 11. African American and Other Traditionally Underrepresented Students in School STEM: The Historical Legacy and Strategies for Moving from Stigmatization to Motivation, Obed Norman.- Chapter 12. Preparing Science Teachers for Diversity: Integrating the Contributions of Scientists from Underrepresented Groups in the Middle Grades Science Curriculum, Rose M. Pringle and Cheryl McLaughlin.- Chapter 13. The Triangulation of the Science, English, and Spanish Languages in the Classroom: Challenges for Preparing Science Teachers of English Language Learners, Regina L. Suriel.- Part V. Policy Reform for Science Teacher Education.- Chapter 14. STEM-based Professional Development and Policy: Key Factors Worth Considering, Celeste Pea.- Chapter 15. Policy Issues, Equity, Multicultural Science Education, and Local School District Support of In-service Science Teachers, Bongani D. Bantwini.- Chapter 16. Policy Issues in Science Education: The Importance of Science Teacher Education, Equity, and Social Justice, Sheneka Williams and Mary M. Atwater.- Chapter 17. Conclusion and Next Steps for Science Teacher Educators, Melody, Russell, Malcolm B. Butler, and Mary M. Atwater.